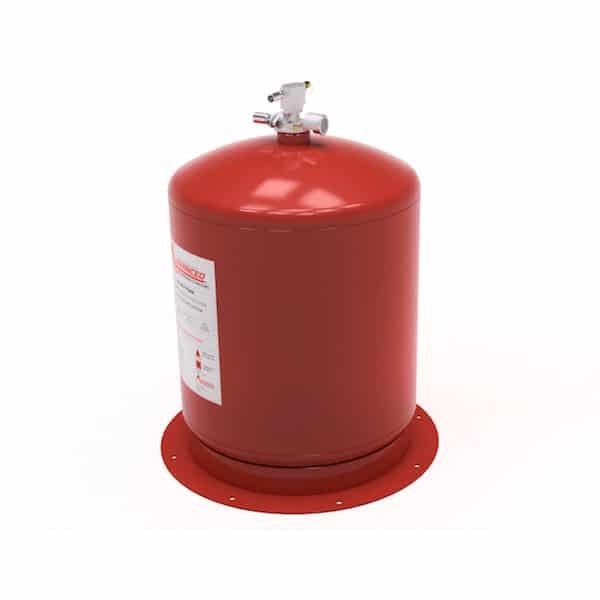 The Advanced 150/250/350 AFFF Bulk fire suppression system is a pre-engineered, fixed nozzle system for protection of off-highway and equipment, power packs, lubrication rooms and oil storage area’s. Each system application will need to be designed specifically for equipment intended for protection. Typical applications include surface mining equipment, underground mining service bays, forest harvesting equipment, land fill equipment, and construction equipment. The Advanced 150/250/350 AFFF bulk system consists of three major components; a container to store the AFFF extinguishing agent; an actuation system operated manually or automatically and an agent distribution system which delivers the agent from the tank through the hydraulic hose and fixed nozzles to the hazard area. The system described in this manual is a fire suppression system and is not designed or intended to extinguish all fires, particularly when unusual amounts of combustible materials and ample oxygen supply are present. It is extremely important that supplement firefighting equipment be available in case the system does not totally extinguish a fire. If an automatic fire detection and actuation system has not been supplied or has been disconnected, the system actuation and discharge will not occur unless the fire suppression system is manually operated. Reliance on a manual release system usually results in a slower reaction to fire. Means to automatically shut down the vehicle must be added to manual or disconnected automatic system.